Eating Korean Chickens Never Been This Fun. Have You Tried "JEANS CHILLI CHICKEN" in Gandaria City? This is a long pending event coverage but I feel like I should share about this particular restaurant. It started when RMJ (RumahMakanJakarta.com) invited me to their first gathering few months ago – that was when I found out about Jeans Chilli Chicken in Gandaria City UG Floor. Jeans Chilli Chicken is a franchise from Eastwood, Sydney, where the owners are pure Koreans. And since I know this fact, I was kind of glad that someone is actually bringing this to Jakarta with reasonable enough prices that are one-third of the original – because paying $30 (~ equals IDR 300.000!) for a portion of hot spicy chicken just don’t make sense here in Indonesia! And what’s so special about Jeans Chilli Chicken? Because it offers Korean chicken like no others. And because it’s fun to do your DIY riceballs. Their signature dish is called Jeans Chilli Chicken (not really creative in the naming though), which is basically a very hot & spicy BBQ chicken in burning Korean chili recipe. To enjoy this, you must also order their Rice Ball (Ju Meok Bap, translated as “fist rice”), a typical sticky fluffy Korean rice served with toasted seaweed & sesame seeds. Jeans Chilli Chicken. IDR 92k for large portion up to 4-5 people, IDR 52k for small portion for 2-3 people. Some extra warning: at first, like me, maybe you won’t really taste its spiciness so you’ll get all cocky and feel like eating A LOT at once. But trust me, it’s hot and it leaves a hot burning sensation afterwards. Even after knowing this I still couldn’t stop eating because these were so finger-licking-ly good!! 1. When you order Chilli Chicken main dishes plus rice, they'll arm you with disposable plastic gloves along with colorful scissors and an empty small plate. I got so excited that I forgot to take picture of these 'unusual' eating cutlery. 2. Cut the chickens into small chunks using the scissors provided and add them to your rice bowl. 3. Knead and mix them thoroughly with your plastic-coated hand. THIS IS THE MOST FUN PART! 5. You're DONE! Messy, but fun. And overall, the spiciness got toned down by the addition of the rice + seaweed + the fragrant aroma of sesame seeds. Man it was addictive! You can substitute the chicken as they also have other main dish here at Jeans Chilli Chicken. There's also Cheese Chilli Chicken (similar, but added with melting mozzarella cheese - IDR 102k large, IDR 62k small) , Chilli BBQ Chicken Feet (IDR 65k), Chili Grilled Eel (IDR 120k), Ginseng Fried Chicken (IDR 92k), EQ Honey Fried Chicken (92k), and Chilli Chicken Egg Roll (IDR 42k). Too bad I came to the event very, very late hence I didn't get the chance to shoot most of the dish above. I'm promising myself another round of visit because I like the overall flavor of this restaurant. One of the few dishes that I could take photos of. 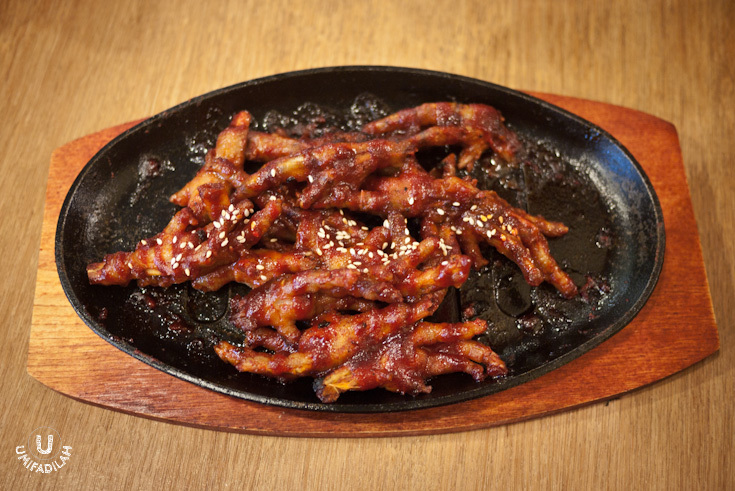 Chilli BBQ Chicken Feet (IDR 65k). I don't really eat chicken feet, but this one - with its burning hot sensation, is something worth considering to try.